Construction workers in Turkey's eastern Marmara region have discovered three sarcophagi from the Roman-period, thought to have belonged to a noble family, reports said on Monday. The sarcophogi were reportedly found at the construction site of the municipal water and sewarage administration building near the coast in Kocaeli's İzmit district, which was referred to as Nicomedia and served as the eastern capital of the Roman Empire in the Third and Fourth centuries (AD). 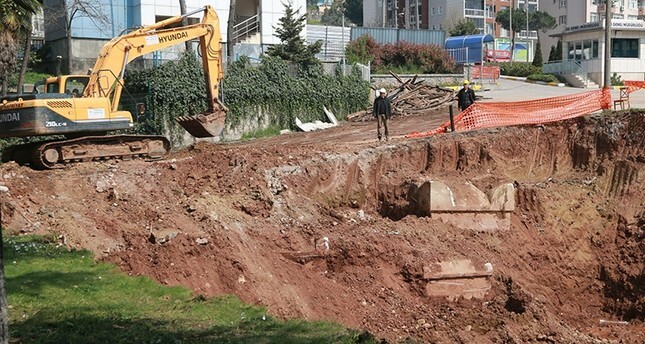 After discovering the ancient tombs at the construction site on Sunday, workers immediately notified officials at Kocaeli Culture and Tourism Directorate, who arrived at the site on Monday to examine the tombs. Police have reportedly cordoned off the area and have taken security measures to prevent any damage to the sarcophogi. Kocaeli Culture and Tourism Directorate President Adnan Zamburkan was one of the officials who visited the site and noted that two of the sarcophogi are thought belong to children, while the other one belongs to an adult. "We will bring the sacrophogi to the museum after consultations with the cultural and natural heritage conservation board" Zamburkan said. Officials from Kocaeli Museum Directorate have also followed the excavation of the tombs, and took pictures, reports said. Archaeologists in Turkey, which has historically been a home to many civilizations, frequently find significant historical artifacts throughout the country, and try to preserve them in efforts to shed light on early human civilizations and pass them on to the next generations.